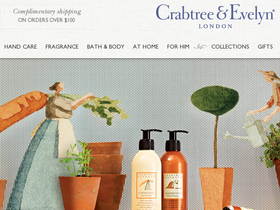 Crabtree & Evelyn, online at Crabtree-Evelyn.com, is your online resource for body and home products. At Crabtree & Evelyn, you can buy body lotion, antibacterial hand gels, bath and shower gel, linen spray, room spray, robes, and drawer liners. Crabtree & Evelyn sells scented candles, potpourri, home fragrance oils, body wash, soap, body spray, men's fragrances, muscle soak, and manicure and pedicure tools as well. There are also exfoliating treatments, scrubs, and nail and cuticle therapy cream on sale at Crabtree & Evelyn. RetailSteal.com has the best Crabtree & Evelyn coupon codes, Crabtree & Evelyn discounts, Crabtree & Evelyn coupons, and Crabtree & Evelyn promo codes. Shipping and handling rates at Crabtree & Evelyn depend on the price of your purchase and your shipping destination. Free shipping is offered for orders over $75. See website for full details. Exclusions may apply. Shop online at Crabtree-Evelyn.com and enjoy up to 50% off a wide range of skincare products. Shop at Crabtree & Evelyn and save 25% on select sleepwear - for a limited time only. Click here to shop. At Crabtree & Evelyn, receive free shipping on your online order when you spend $100 or more. Click link for savings. Get your gifts online at Crabtree & Evelyn, now from as low as $14. Save 50% on select products from Crabtree & Evelyn. Click link to save. Place an online order of $125 or more at Crabtree & Evelyn and get a free gift. Click link to shop.